Options “El Chicotillo” is positioned as one of the hottest in Bolivia. Among the sweetest, are the “Asta de Toro” and the red pepper of San Julián. Chili permeates the palates of the world thanks to Bolivia. This is how renowned chef Marko Bonifaz defines this product grown in the municipality of Padilla and of which eight varieties stand out. “Among the red chili varieties we have the Chicotillo, the Punta de Lanza, the Huacareteño, Asta de Toro and the red pepper of San Julián. On the other hand, among the diversity of yellow peppers are the Yellow Asta de Toro, the orange Asta de Toro and the yellow Huacareteño,” said the owner of El Huerto restaurant, Federico Sánchez. Options. Surprising species of peppers that grow naturally, “such as ulupica, green chili, aribibi (ají gusanito), among others” and other peppers that were not yet classified by the community of the region, said Sanchez. Many of the varieties of peppers from the valleys of Chuquisaca are named after the producing region or have a pseudonym alluding to the appearance of the fruit. Padilla is a small valley land that belongs to the province of Tomina, department of Chuquisaca. The inhabitants of the municipality, of Quechua origin the majority, managed to turn the capital of Bolivia into one of the largest producers of peppers in the country. “During the festival, attendees will have a taste experience from the hand of five traditional cooks who will arrive from different parts of the country with dishes such as mondongo and charquekán; there will also be five chefs who will present innovative recipes with ingredients of Bolivian origin, such as Ají de Padilla,” added Fernández. The hottest chili in the country. 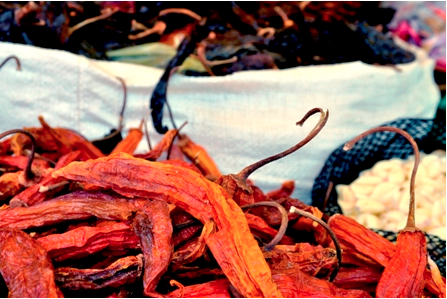 With an elongated shape and intense reddish color, Chicotillo is known for being one of the hottest peppers in Bolivia. “Among the semi – spicy, we can find Punta de Lanza and Huacareteño; and among the sweetest are the Asta de Toro and the red pepper of San Julián,” said Sánchez. According to an investigation by the Foundation for the Promotion and Research of Andean Products (Proinpa), there are more 45 ecotypes of chili that are produced in the country, Chuquisaca produces 84% of the Bolivian pepper, followed by the departments of Tarija (6.8%) and Santa Cruz (3.7%), while Cochabamba and La Paz account for 4.5%.